A mysterious young girl found sleeping in a capsule in the middle of a dump site by Simon. She had no prior contact with humans, except her father, who is also the sovereign of the Beastmen, the Spiral King. She is very curious, pure and innocent, due to growing up sheltered in a peaceful environment, away from all the battles occurring in the outside world. Despite early misgivings, she is quickly accepted by Team Dai-Gurren, much to the (initial) irking of Yoko. During her journey, she develops a strong empathy towards Simon and grows to be his fiancé. 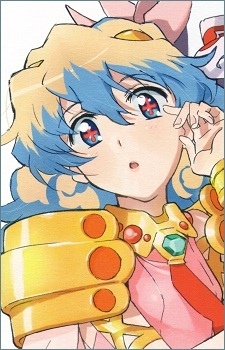 After her encounters with Divine Generals Adiane and Guame, she comes to an understanding of the reason Simon found her outside the palace, being forsaken by her father after she started attaining her own will and self-consciousness, as he considered his offspring merely toys to play with as dolls, and decides to join The Team Dai-Gurren as a cook (even though her cooking is unbearable to anybody but Simon) in order to confront her father. In the final battle with Lord Genome, she boards Lagann with Simon and aids him in the destruction of Lord Genome. Seven years after Teppelin's fall, Nia and Simon are engaged, but soon after she is overtaken by the Anti-Spiral race to become a digital messenger. After the defeat of the Anti-Spirals she and Simon get married, though she begins to fade away before the shocked crowd but an unsurprised Simon. She tells Simon she loves him and he answers back saying that he will never forget her "till the end of the universe". Nia corrects him, stating it will never end and that's what they'd worked so hard for. She smiles as Simon says he loves her and she fades away. Nia's memorial site is near the graves of Kamina and the members of Team Dai-Gurren who died fighting the Anti-Spiral. Her memorial has the flowers she held at the wedding along with a sword. Tengen Toppa Gurren Lagann Figures: Pierce the Sky Wide Open! Now you too can own our favorite underground dwelling boys and girls! Check out these beautiful figures of the main characters of the action comedy Tengen Toppa Gurren Lagann.